Fish-Net Shirt is a satisfactory substitute for the Eskimo caribou garments in the Arctic. It allows body perspiration to evaporate and form a vapor barrier, thus conserving all possible natural heat needed in frigid climates. 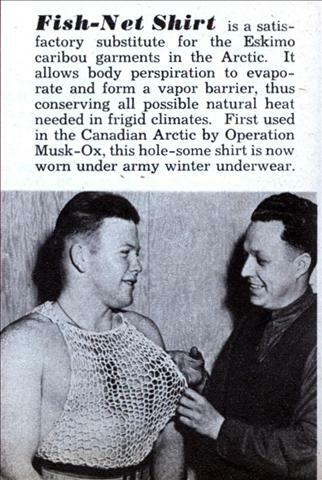 First used in the Canadian Arctic by Operation Musk-Ox, this hole-some shirt is now worn under army winter underwear. That’s no joke. Still in style for for polar expeditions. Check out brynje.no. They offer classic cotton ones that are very similar to the one above, as well as more modern fibers. Why does that man have such big bazoombas? The Birth of gay fashion!